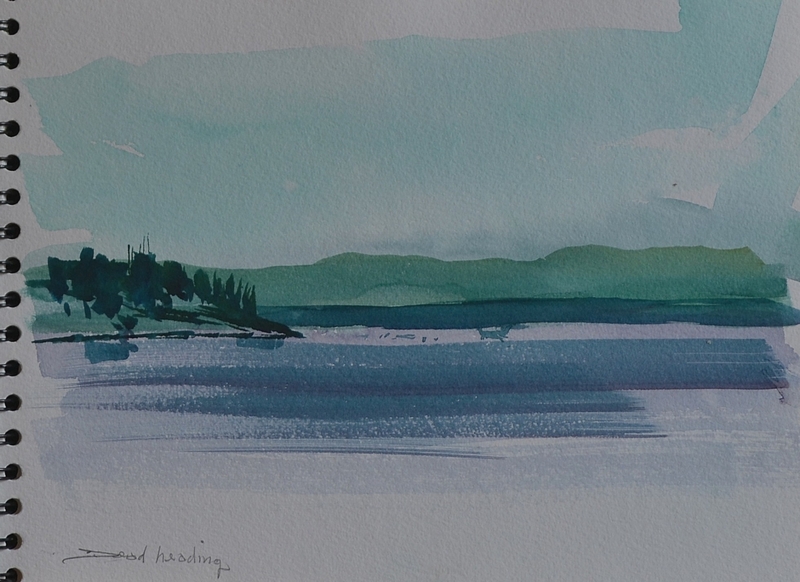 Perhaps no medium is more adaptable to outdoor on-site painting than watercolor. It is quick drying, very light, versatile and easy to carry. 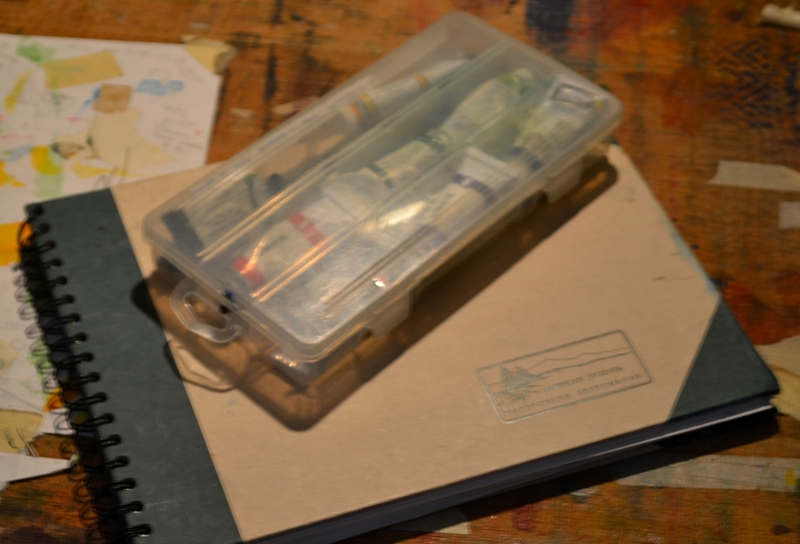 Many years ago I developed a travel pack that takes up very little room while offering me a great deal of flexibility in the tools and paints I can carry. I became accustomed to trekking into wilderness locations. Anyone who has enjoyed back packing knows that your gear can become very heavy. While french easels and the like are great, try carrying one along with your other necessities over rugged terrain. It won’t take long before you decide it is not worth it. My gear is very simple and light weight. The travel pack consists of a clear plastic container that measures about 5″ x 9″ x 1.25″. It has a snap lid and will float and has a built in bracket where you can attach a lanyard if you like. The sketchbook is a 9″ x 12″ American Journey sketchbook. As for an easel or painting surface, I make use of what I can find in the wild. I may use my lap, a rock or log or the gunwale of the canoe; whatever works. Make sure you have some sort of water container. Years ago I would carry an Army surplus ammo can. However, if you carry it full of water it can be rather heavy. The most important thing is to make sure that you are using a reliable water source. Contaminated water can adversely affect your painting. You can filter drinking water or take a little from your canteen. In the sketches I will display I took my water directly out of the lakes. These days one would wisely think twice about drinking directly from a lake or stream. Years ago I had the joy of canoeing the Boundary Waters just northeast of Ely, Minnesota. We canoed from there up into Canada. The following sketches chronicle some of the moments of that trip. These are watercolor sketches that were produced during my down time between paddling sessions. Most of them are quick pieces that I completed while “deadheading”, that is sitting in the middle of the canoe while my partners paddled. There was a small cup tied to a lanyard. That was our drinking cup. We would drink directly from the lake when we were not near beaver dams. We were in an area where no internal combustion engines were allowed and the water was clean. Imagine , if you will, reclining in a canoe in late summer in the north woods completely out of range of any telephone, TV or radio. Nothing but you, the dark water, billions of stars and a magnificent display of northern lights. Sadly, my sketch doesn’t even begin to approach the beauty of the moment. However, this simple sketch does help me to recall the experience. Will I ever be able to do it justice? We shall see. Imagine acres of ripe blueberries. For me it was like heaven since I dearly love blueberries. One caution, the bears love them too. You have to be very respectful and mindful of your furry neighbors if you decided to feast. A fleeting scene of the landscape as we made our way toward Le Grande Portage and into Canada. The lakes are interconnected. When one lake ends you get out and carry your canoe overland to the next lake. At times the lakes are at a much higher elevation. In this case were were jumping from boulder to boulder on our way into Canada. I had the privilege of scaling a cliff with a canoe. It really helped me get in touch with my ancestors who used this path on a regular basis. A wonderful way to paint wet into wet is in the rain. Never say never. Finally the mist gave way to full rain and I had to close my gear. 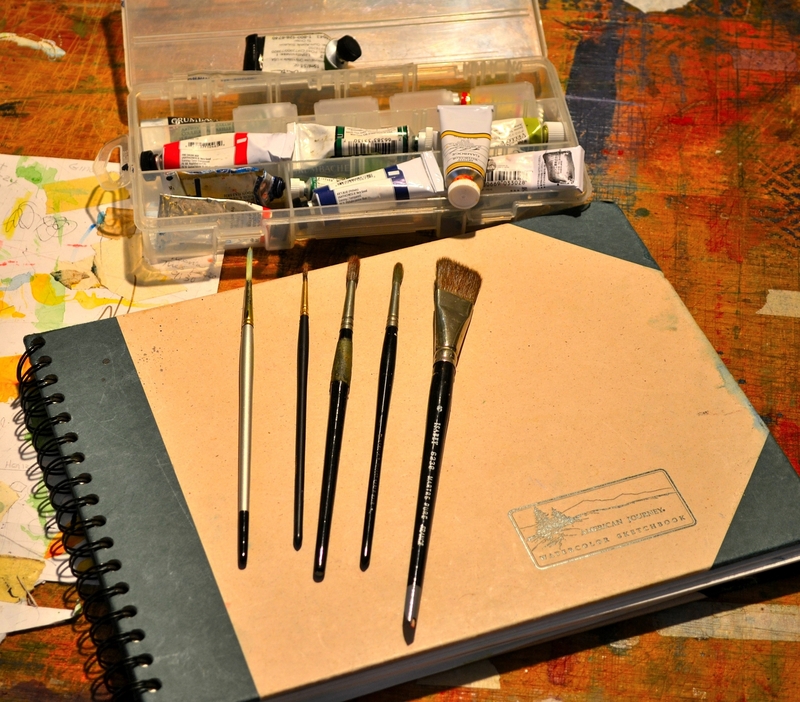 At times I find painters who are reluctant to show some of their sketchbooks. I do this because I have students who are often confused about plein aire work and why it is important. I think it is important for many reasons. It helps sharpen our observation skills. Working on the spot is an never ending challenge. It is also a wonderful lesson in humility. We win some, we lose some. We keep on trying. These are quick fleeting sketches. By no means do they approach a finished state. Yet, in their simplicity I wanted to use my brush to capture moments for me. The world may not hold them in high regard but this is a part of my working method. I’m not sure why but there are times when I will mull over sketches for years before I paint the subject. No explanation for it. It is just my way. Perhaps that way I filter out the unnecessary. When I come back and do the final pieces I’ll get more involved. Too often students and the general public will think of the glazing technique as a long boring labor intensive chore. Nothing could be farther from the truth. Glazing can be what you want or need it to be. Get out in your own neighborhood, select a spot and paint. Try to focus your attention on a simple subject and don’t try to paint the entire world in one sitting. Focus, focus. Be kind to yourself and don’t be afraid to dive in. Good Painting! Watercolor painter and author of several watercolor books on painting technique. Recent inductee/recipient of the Marquis Life Time Achievers Award. 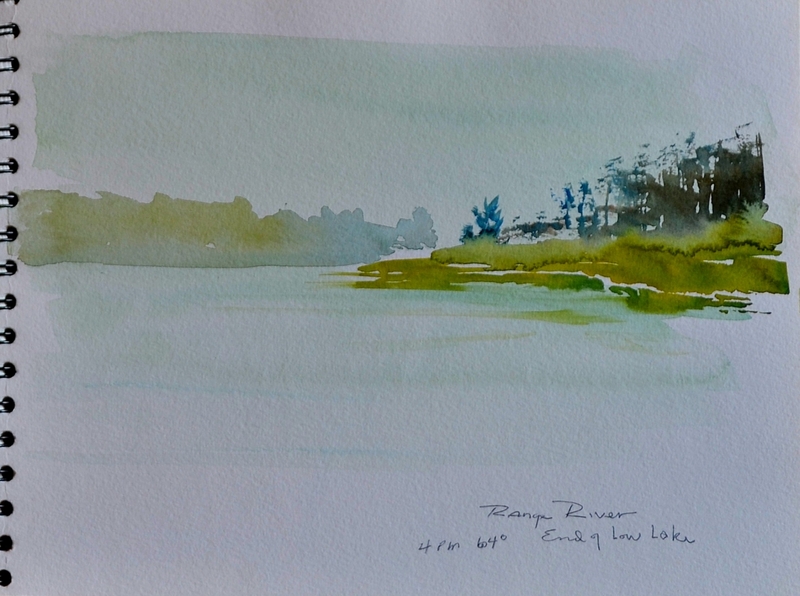 Posted on January 12, 2013, in Don Rankin watercolors, Uncategorized, watercolor glazing techniques, Watercolor painting and tagged American Journey sketchbook, Boundary Waters, Ely, Minnesota, plein aire watercolor, watercolor glazing techniques, wet into wet watercolor. Bookmark the permalink. 16 Comments. Great post, Don. Thank you for sharing your sketchbook – really inspiring for those of us who find it a bit of a challenge to working outdoors. I notice you use tubes of paint rather than a tin with pans and was wondering what surface you use for mixing the colour? It looks as if you’ve been on some amazing trips. I’d definitely be wanting a taste of those blueberries – giving the bears a wide berth. Vandy,thanks for your comments. My apologies for not sharing that I use the inside of the top of the plastic box for a palette. I know tubs are popular in the UK but they are still a little of a rarity in the USA. Technically, tubs are superior in terms of being wet and re-wet over and over again. In reality they are technically superior for the sometimes painter. Theoretically, tube paint should not be re wet once a session is over. Having said that I am as guilty as the next fellow of committing that sin. I’ve been doing it for years with no ill effect. In spite of that the technical experts say that tube paint should not be re wet and used again and again while tubs are perfect for that sort of application. No doubt you have noticed that the “tub” watercolors are a bit more tacky. It is said that the tub contains more preservative and binder than the tube product. As for the blue berries….delicious and tart. You can try Linked-in sites that deal with watercolor and other aspects of painting. However, in my experience they don’t seem to discuss much about techniques. However, if you post a question or begin a thread someone will respond. In that way you may get a lot of opinions. My site deals with a lot of watercolor glazing techniques. While I didn’t invent the process I got credit for writing the first authoritative book on the subject. I came into the method while studying classical egg tempera in Italy and additional input from Rex Brandt here in America. Brandt’s comments sort of “turned the lights on” for me and everything made perfect sense. Having said that anytime you have a question feel free to ask. I’ll be glad to respond. Dabei nimmt man durch unterstützende Bewegungseinheiten nicht nur schneller ab, man kann dann auch mehr essen, beugt Muskelabbau entgegen, regt den Stoffwechsel und die Fettverbrennung an und erhöht den Grundumsatz. Thank you for your comments. I often think a lot of painters are reluctant to show their sketches due to their often fleeting unfinished state. However, this is the crux of where ideas come into fruition.